Archy and cramped feet no longer limit the number of laps skied during the day in the new BFC 100. Spyne technology creates a smooth, consistent flex pattern in a forgiving 100 flex, and the CushFit liner with optional USB rechargeable Thermic technology keeps toes toasty while efficiently transferring power to the shell of the boot. With an emphasis on ease of entry and focus on all day comfort, he BFC 100 will allow you to focus on your turn technique, and not your feet. 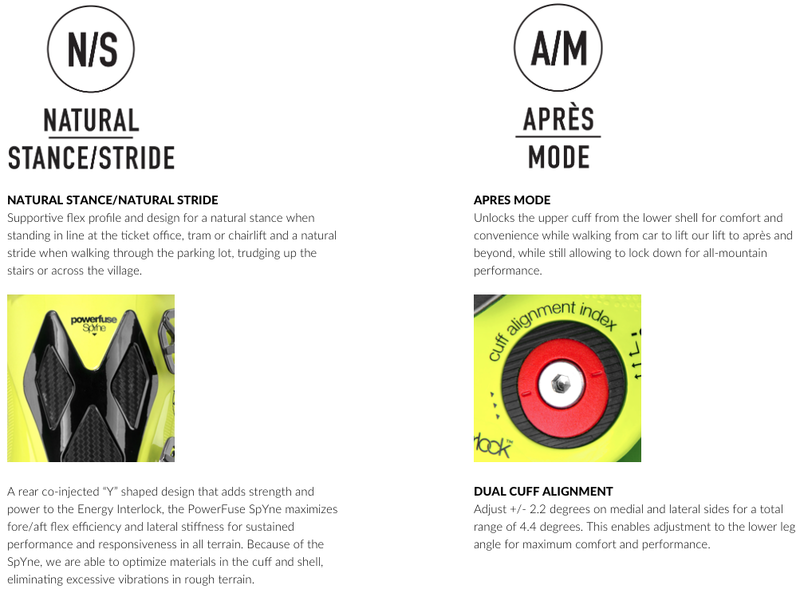 Supportive ﬂex proﬁle and design for a natural stance when standing in line at the ticket ofﬁce, tram or chairlift and a natural stride when walking through the parking lot, trudging up the stairs, or across the village. Unlocks the upper cuff from the lower shell for comfort and convenience while walking from car to lift to apres and beyond, while still allowing to lock down for all-mountain performance. A rear co-injected “Y” shaped support that adds strength and power to the Energy Interlock in order to maximize fore/aft ﬂex efﬁciency and lateral stiffness for responsiveness in every type of terrain. Dual sided cuff alignment for +/-1 degrees of cuff adjustment.